The quote, 'be careful what you wish for because it might come true', has never before worked for me. I have been wanting and wishing for Ryan Gosling and non weight gaining red velvet cupcakes, like forever. While some dreams may never ever come true a few might just do! 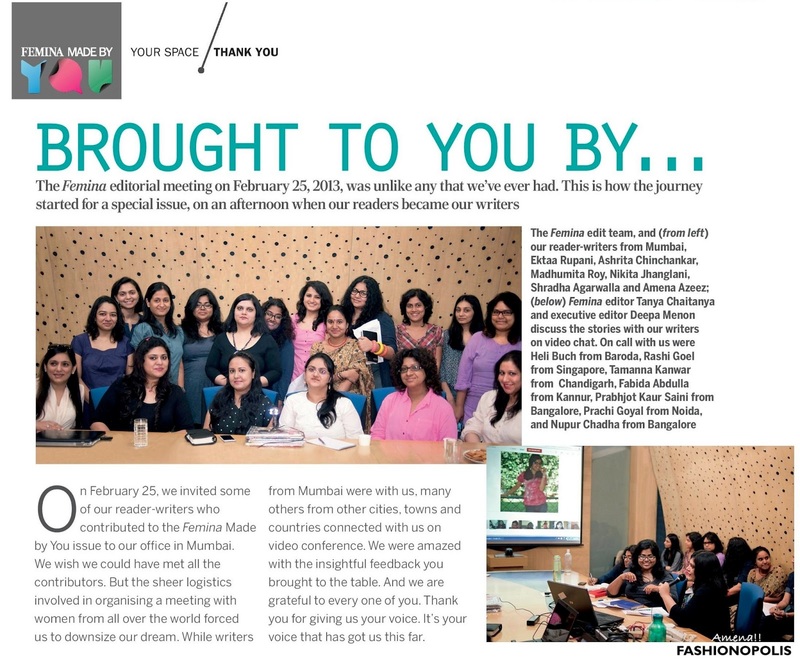 When I submitted my article for 'Made By You', Femina's first ever crowdsourced issue, the hope was to get published in one of India's most read and loved magazine. Never in a million years did I think that I would get a chance to be featured on the cover. THE COVER!!! I was one of the five writers chosen to contribute for the 'Fashion Documentary' segment. We each had to write about the stylish part of our city. Without a shadow of doubt I knew that my muse for this piece would be none other than Colaba. For starters, Colaba is one of the few parts of the city that has not been engulfed by the growing mall culture. One of the reasons why this has not happened is because Colaba on its own is like a big market open to all. Whether you are looking for pocket friendly street shopping or high-end luxury good, Colaba has something for everyone. A landmark location that has managed to incorporate the new with the old, blend east with the west and most importantly welcomed people from all walks of life, social strata and from around the world to come and enjoy a slice of Mumbai life. Whether your spending allowance is Rs. 200/- or Rs 2 Lakh, be it cheap, chic or couture, Colaba is one place that has it all.The mixing of luxury, high street and street style fashion is one of the major reasons why among all the 7 islands of Mumbai, Colaba is hands-down the most stylish of them all. 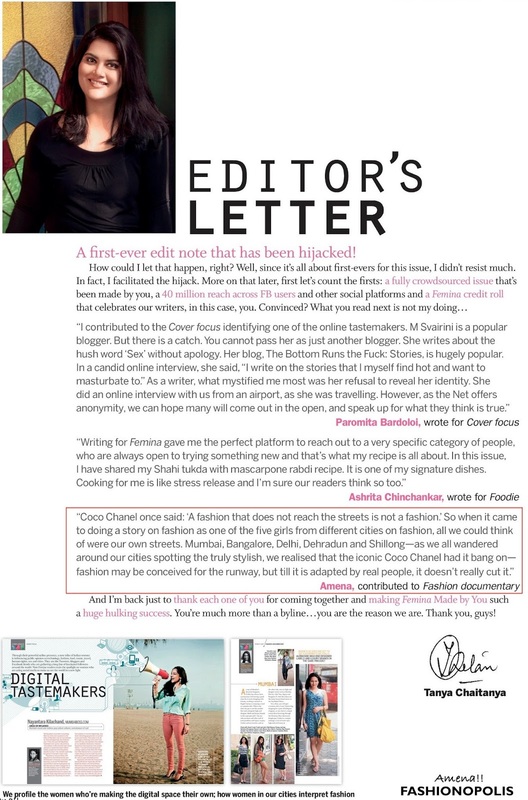 Other than the cover and article, I had a chance to write the Editor's Letter for the Fashion section. This is where it all began. At the Femina Made by You editorial meet. It has been one of my life-long dreams to write for a fashion magazine. In fact, my passion for fashion writing is one of the main reasons why I started a fashion blog. 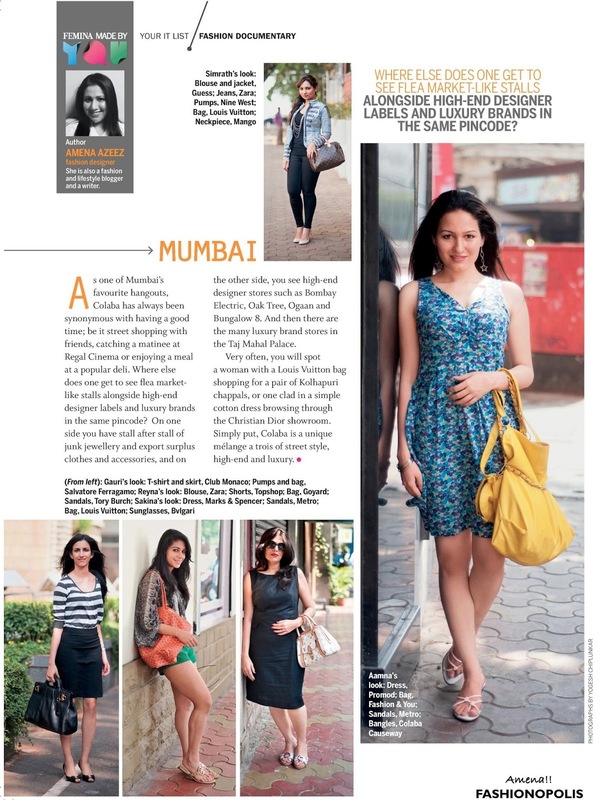 I will forever be grateful to Femina for giving me this wonderful opportunity. While most of you have already ready the article, I just wanted to share this with you all. 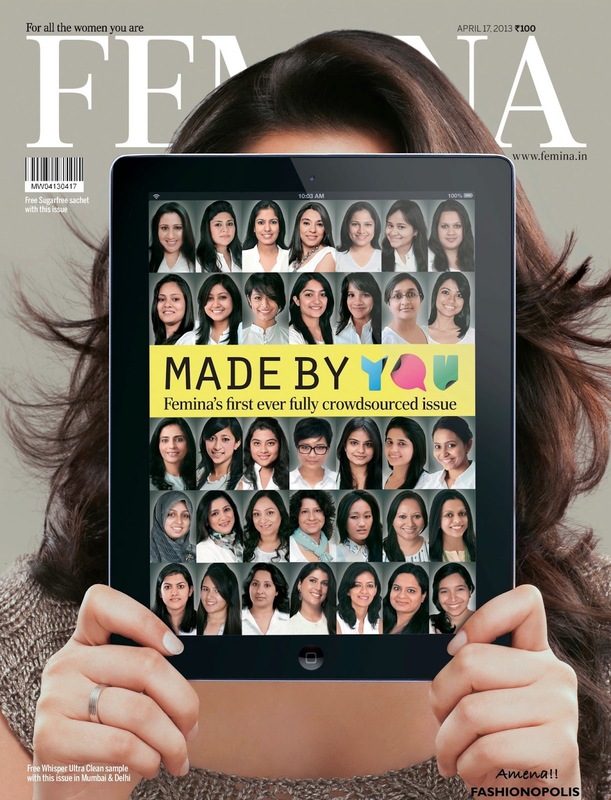 What did you think of Femina's first ever crowdsourced issue, Made By You? Did you like the concept? And what did you think of my article? Share your views with me in the comment section. Thank you so much Ritcha. For your kind words of encouragement and the support you were through it all. One of the other best blessing of my blogging experience is finding a friend like you. Muah!!!! Congrats on being on the cover A! Thank you my darling Gargi. Muah!! Fabulous girl. So proud of you. Can't wait to get my hands on the issue once I am back. Hugs. Vinitaaaa, thank you my darling. Once you get your copy do let me know what you think of my piece. Muah. Hey Kalyani. Thank you so much for your kind words. The support of a fellow blogger means a lot. You deserved it completely, Amena :) So happy & proud ! Being on the cover page of a magazine must be an awesome feeling, I can totally imagine :) Kudoa girl! oh and I love Colaba too, its so cool, totally Bombay and full of life. Congrats Amena. You couldn't have picked a better place to write about! !